Your Home Decoration is in Your Hands... You Don't Need to Hire a Professional to Design Your Home Suitable for Your Taste, Do it Yourself for Only a Fraction of the Cost. Feel Like an Interior Designer: You can show everyone how great you are, it is finally time bring out your home decorating talents to the spotlight. Decorate your home with a unique art collection to add flair and style to your empty wall space. this hanging shelf can be used as a spice rack to help you keep your favorite flavors within reach, so cooking like a professional is fun, not frustrating. Makes the Perfect Gift for Any Holiday or Occasion: Finding the right gift is always frustrating, tiring and expensive, but not anymore. Now you can make someone special happy in the comfort of your home with one simple click, and have it delivered to your door step. display photos of favorite memories, decorate your home with ease, stay within your budget and give someone special a bundle gift. Product Dimensions: 46" x 2.5" x 3.5"
Photo Collage: Create a wall collage with your favorite memories, you no longer must spend days or months trying to decorate your walls, these display ledges are perfect for showcasing your memories without misaligned frames and damaged walls. 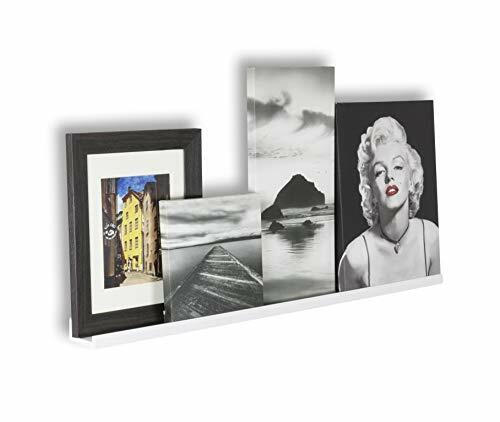 Amazing Offer: This floating photo ledge comes for an unbeatable price. Get this offer while supplies last, you can use it in any room you desire, it is simplistic decoration for your living room, hallway, dining room, etc. Easy Decoration: You've got walls, so utilize them efficiently to decorate your home easily. This bundle offer is great for using staggered on the same wall or in separate rooms, you can decorate multiple spaces with one purchase. No Assembly Required: Unlike leaning ledges, bookcases, furniture storage solutions this floating shelf does not require an assembly, and to make it more convenient for you, the installation hardware is included in the packaging. Showcase Your Collectibles: Do you love collecting unique, vintage and antique objects, or memorabilia? The display ledge is perfect for keeping things intact and for showcasing small items, you can beautifully line up your Willow Tree collection and showcase it proudly.